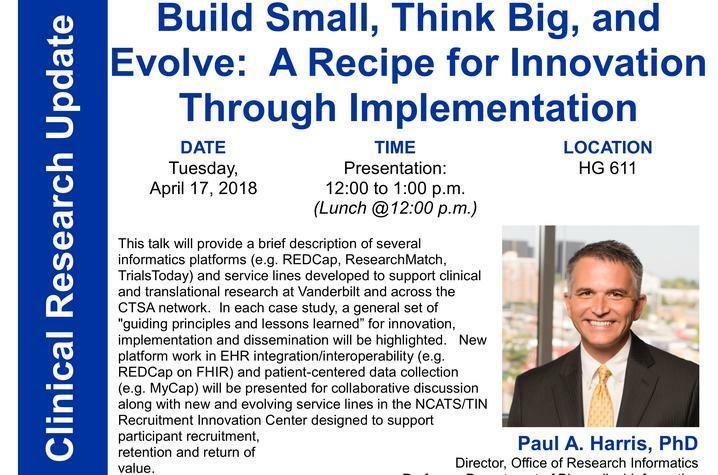 LEXINGTON, Ky. (April 16, 2018) – The UK Center for Clinical and Translational Science will host Paul A. Harris, Ph.D., director of the Vanderbilt Office of Research Informatics and Recruitment Innovation Center, for a Clinical Research Update on Tuesday, April 17 from 12:30 – 1:30 in HG 611. Harris is a national expert in informatics and participant recruitment, and specializes in the development of innovative software platforms to support the research enterprise. His presentation, titled “Build Small, Think Big, and Evolve: A Recipe for Innovation through Implementation,” will provide a description of several informatics platforms (e.g. REDCap, ResearchMatch, TrialsToday) and service lines developed to support clinical and translational research across the Clinical and Translational Science Award (CTSA) network, of which the UK CCTS is a member. In each case study, Harris will highlight guiding principles and lessons learned in innovation, implementation and dissemination. He will also present new platform work in EHR integration/interoperability (e.g. REDCap on FHIR) and patient-centered data collection (e.g. MyCap), along with new and evolving service lines in the NCATS Trial Innovation Network Recruitment Innovation Center that are designed to support participant recruitment, retention and return of value. Please RSVP by Monday, April 16 to ccts@uky.edu. Lunch will be provided to registrants at noon. To learn more about comprehensive participant recruitment services available through the the UK Center for Clinical and Translational Science, visit the website or contact Roxane Poskin at roxane.poskin@uky.edu.